This is the first time the world will have explored an extraterrestrial ocean. Despite being a moon, Saturn’s natural satellite Titan is remarkably planet-like. More notably, it has striking similarities to Earth such as clouds and a dense atmosphere. It does, however, have oceans of liquid methane instead of water, since its temperature is far too cold for liquid water to exist. This would make is most uncomfortable for much of life on Earth. Still, scientists have reasons to believe that life could emerge under these harsh circumstances, since its thick atmosphere is rich in methane and other organic compounds—signs indicative of life from an Earthling’s perspective. According to NASA, methane would’ve been irreversibly destroyed by sunlight after tens of millions of years. On Earth, methane is replenished by the metabolism of living organisms. What replenishes Titan’s methane and keeping it in abundance is one of the mysteries that lead scientists to believe there might be, or may have been, organisms responsible for Titan’s atmospheric content. To get to the bottom of the mystery, NASA is embarking on what BBC calls the “most revolutionary mission ever attempted.” They are designing a submarine that would one day brave the formidably named Kraken Mare, Titan’s largest ocean—a hydrocarbon body larger than the Caspian Sea. 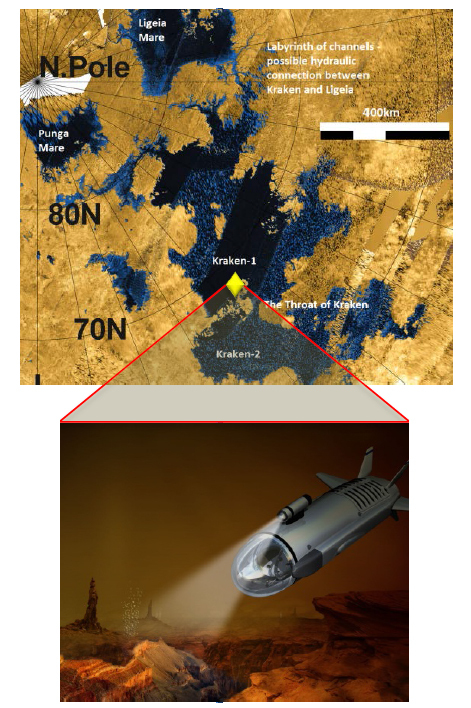 While this is exciting, it will take a while before the conceptual Titan Sub is realized, much less launched to Titan. Simulations estimate that its earliest possible arrival to the planet-like moon is 2038, when alignments between Earth, Saturn and Titan are favorable.